I am here in Ghana trying to book an airline flight from Accra to Chicago. These five booking sites will allow me to search for a flight. 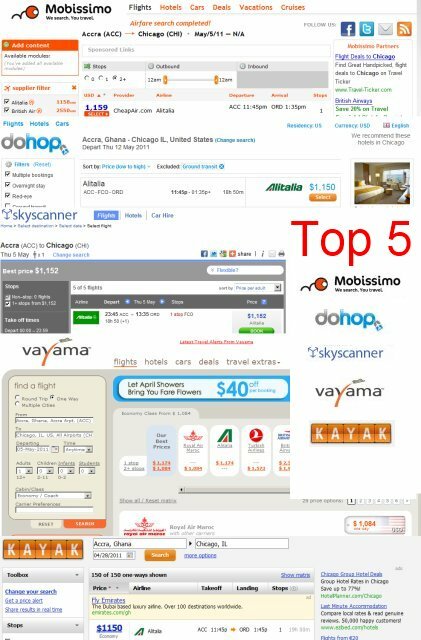 I am pointing out the top five sites that allow you to price airline tickets globally. This means if you walked into an Internet Café anywhere on the planet, with these sites below you have the optimal chance of finding a flight effectively, efficiently and in a timely manner. This does not mean the site is actually going to allow you to purchase the ticket. I am in Ghana, West Africa in April of 2011. To be called a global airline booking site, the site needs to be helpful worldwide. I am presently in one of the scam capitals countries of the planet. 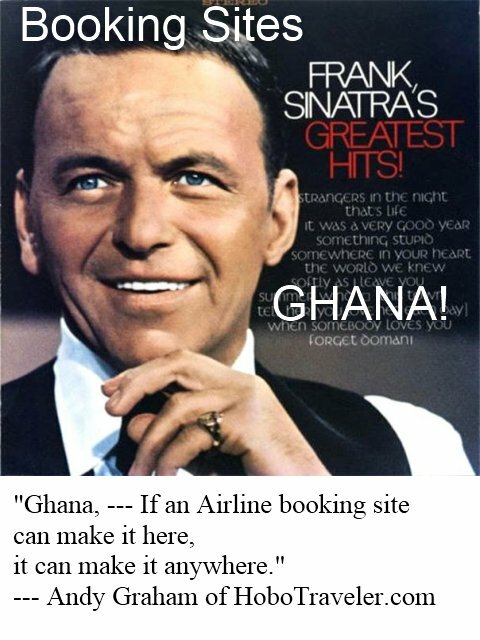 Maybe Nigeria is the epicenter, nonetheless, Ghana is a great place to test airline booking sites. I did a search for a flight from Accra, Ghana to London, England for May 5, 2011. These sites below refused to allow me to check air ticket prices. There are many variables involved, however in my best estimation these sites are not helping on a truly international or global airfare level, more or less they wish to take the cream off the top, and ignore countries where you truly need help. "Ghana, if you can make it here, you can make it anywhere." I try to buy from agents, however I need sites like the ones above to plan and to know the price goals to ask for with agents. Depends where you are flying from, time of year, day and time of flight and other variables, in 2010 caught an advert in local newspaper that American Airlines had a special, one day only to USA, including all taxes, I saved $200, had to change planes in Miami but was well worth it, Spirit is soon coming here to El Salvador 13 June, perhaps will fly up with no luggage, try it out anyway. Antigua Guatemala travel agencies had some good specials out of Guatemala advertised when I was there last week, I used to live and work in travel in Antigua, everyone was buying me meals and food, by teh way Andy, Doris, the manager of Hotel Casa Shalom, says hello, for 100 Quetzales approx 13 USD got a single, sharede bath, breakfast, kitchen, and use of PC, prices have gone up everywhere in our region since last year, especially, gas and diesel, more expensive than in USA now, food prices, gas for stoves, lodging places, et al. Andy, Panajachel has now over 300 tuk tuks plus they allow shuttles and tourist buses to drive around, plus local traffic, Pana is not a pleasant place to stay more than a day or two now, there is a road and tourist shuttles direct to San Pedro from Antigua, San Pedro cleaned up by frequent police patrols, the far out international junkie community there were sharing drugs with local kids and natives got pissed off, so PNC and DAN came in, San Lucas Toliman is really nice. saludos, Don Lee. If you need any advice and contacts in the Dominican Republic, I can help out I was in house Counsel to the Dominican Consulate and have numerous contacts and connections there.